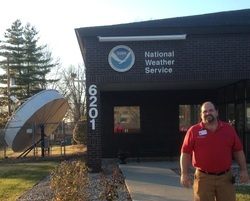 A media visit to the National Weather Service recently by Rick Wesley of RadioLibertyKy.com, the guided tour included the main control room where decisions are made concerning forecasts and severe weather announcements for the Louisville area. Joe Sullivan the senior Warning Coordinator demonstrated the signatures of a tornado on Doppler Radar. 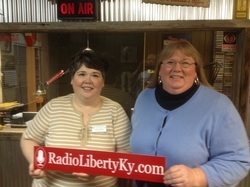 Jetset Getset visited radiolibertyky.com on January 31st to promote their new single "Saturday Night". If you missed the live show earlier today click here or the photo to the left to listen to some of their music on the RLKY blog. A follow up video of the interview will be posted soon! 1-30-13 Judy Emerson above left presented an award for her years of hard work to the Chamber. Audrey Narducci above right from Stanford Medical Park/Ephraim McDowell Health talks to the group about cancer prevention.